Event Rugs supplied the red carpet that helped create this fabulous red carpet runway. 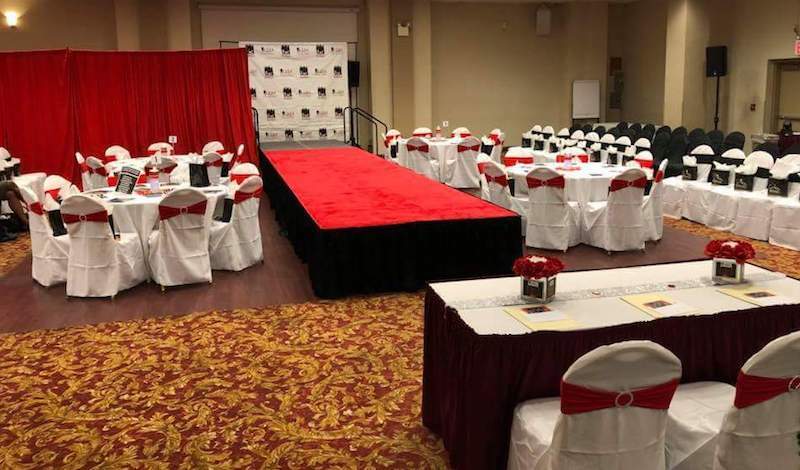 If you are planning a fashion show or pageant and want the effect of a catwalk or walking the red carpet you can create the effect with the help of a red carpet aisle runner. This particular client of ours (in the photo above) pulled out all the stops and created a red carpet runway with a photo backdrop and a curtained off section for the behind the scenes activity. DIY: If you are looking to create a similar effect but don’t have the budget, we have created countless carpet runways on the floor, i.e. without a stage or platform. They look great and can be just as exciting! Posture – Walk tall. Stomach in, shoulders back, chest out. Don’t exaggerate – Walk natural, no need to exaggerate your walk. Swing your arms – Again, walk natural and let your arms swing naturally. Eyed Straight Ahead – Don’t look down. Music – If there is music, let it motivate your walk. End and Turn – When you walk to the end of the runway, pause slightly as you turn to go back. Find our red runway carpets in our online shop! ⟵A purple aisle runner at the beach?